If you have been following our blog for the past few years and making our recipes, you would have discovered by now that even though we work in the food and beverage industry and there is a classically trained chef on board, we are both advocates of practical, simple, tasty food. Some people call that “honest” food. We believe life is a feast and everyone is invited to partake. You do not have to be rich, popular or anything but yourself. As Chef Lij says in practically every interview and TV appearance, “The simple things are the hardest to do.” But why is that? Is it OK to serve guests scrambled eggs and sausage for breakfast or bread and butter pudding for dessert? Yes. But aren’t those things too homely and regular? No. Not if done well. 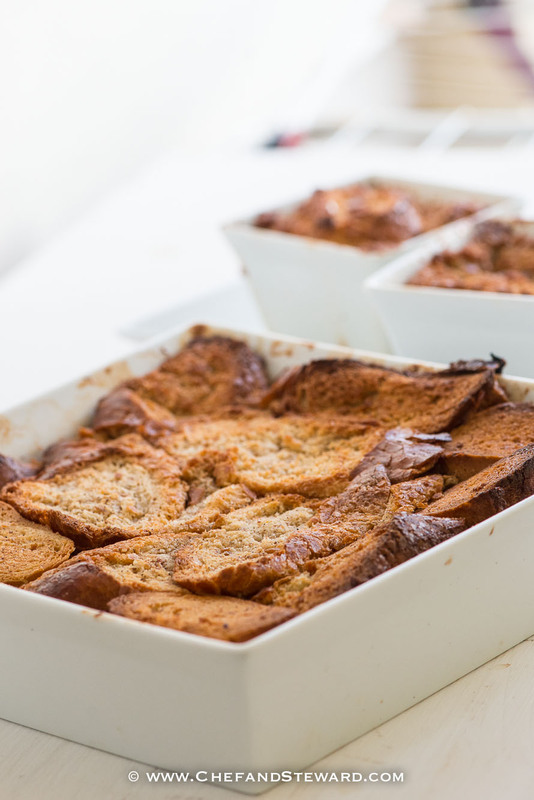 This recipe for a French Toast Bread and Butter Pudding combines all the adjectives above. Practical, simple, honest, homely and everything but regular. 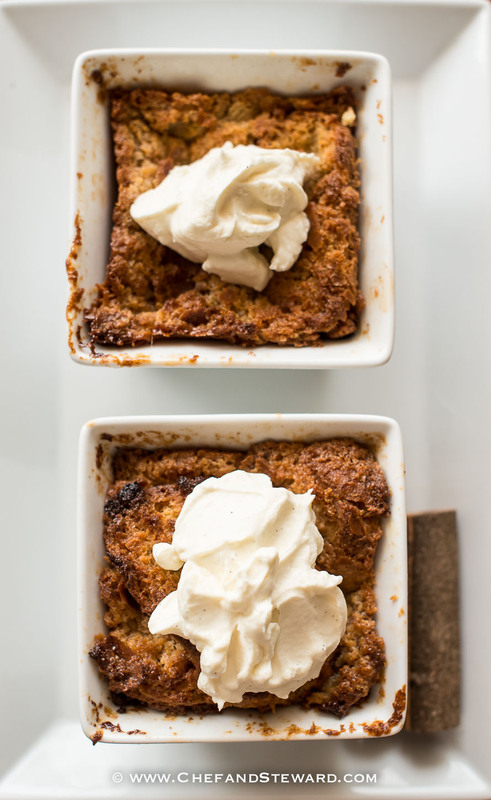 It was inspired by Kathi Cooke, the first person to hack the very pudding-like texture that many find off-putting with a traditional bread pudding and turn it into something superbly amazing with added texture. So if you are among those who cannot stand the baby food mush of bread pudding, this is for you. If you want a practical, inexpensive but luxurious dessert or tea time snack, this is for you. It travels well so it makes a great potluck dish or picnic or BBQ dessert as well. This is dessert for all seasons, reasons and persuasions. I baked this in two different sized and I must confess that I love both. The larger 8x8 one was made in a porcelain ASA square dish and the smaller ones were about 3x3 ASA squares. I had left overs and refused to throw so the ramekins worked. Furthermore, I spiked the larger quantity for the adults and left the small one for a toddler who has a bit to go before drinking age. Funny enough though, growing up we consumed alcohol in desserts and drinks but that is just the culture in places like the Caribbean, France and Italy. You only live once. I also like to use different types of bread so that adds to the textural contrast. Use at least one French baguette and another kind of baguette. If you can only find French baguettes, use two. Pour the liquid on top, patting down the bread on top to absorb as much liquid as possible. Let it stand for 10-15 minutes. Smear the remainder of the butter all over the top of batter then place in oven. If you have excess bread and liquid, , place in ramekins but watch the cooking time as it will be shorter. Or you can simply decide to bake it all in ramekins for cute serving size portion presentation. Bake in a preheated oven at 190C/375F until toasty on top and the pudding appears firm to touch. The time will vary depending on the size and depth container you use and the kinds of bread. This is one of the few baking recipes that allows you to open and close the oven without damaging the results. Serve slightly warm with cold homemade vanilla bean extract whipped cream or a great quality vanilla bean ice cream. I grew up on bread pudding – it’s ultimately a frugal food to use up left-over bread. It nurtured my custard obsession with it’s eggy middle. However our’s certainly didn’t have rum in it! Love your Caribbean version. Yes it was for us too. Stale bread would be set aside for this purpose. This one isn’t very custardy but it is still delicious! It is good idea for left-over bread, thanks for your sharing. Happy to share and thanks for dropping by. Enjoy Ma B! Its very simple and would be nice alongside eggs for breakfast. Wonderful take on a classic! I am hankering for some more myself! Still one of my absolute favourites! Very Nice! Happy we did it justice! Thanks for doing it differently for years! Love this – looking forward to making it myself! Yum, I just posted french toast on my blog like last week! Great minds think alike? Or food lovers of the same palate? 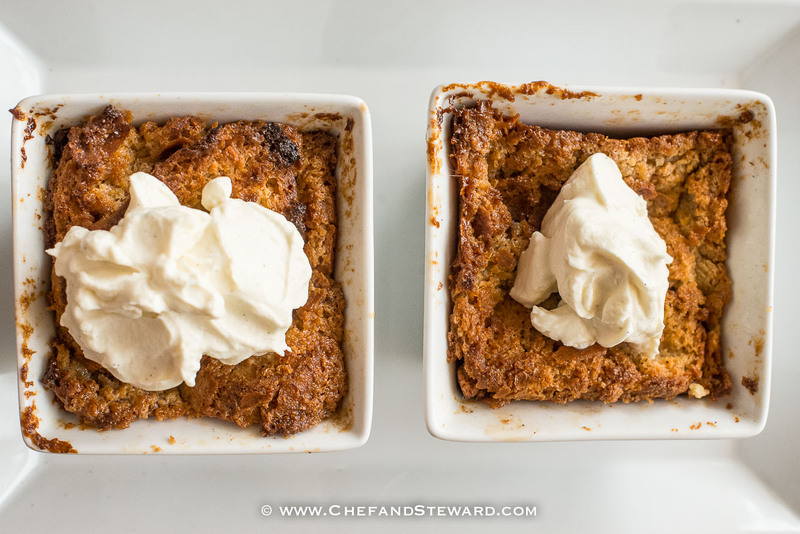 My husband loves bread pudding, but (like you mentioned) I’ve never liked the texture. This recipe might be just right for both of us! Love the idea of buttering the bread, as well as spreading butter over the batter. Oh man! Bread pudding with brioche and challah is also fantastic. It’s a fave breakfast or brunch item. The lavish buttering is what makes it very crispy. Not for those who are afraid of fat or who think saturated fat is the scourge of the earth.